"PRO PET WORKS PERFECT BLEND"
SEE WHY OUR PET DENTAL SPRAY/WATER ADDITIVE IS THE BEST ON THE MARKET! OUR PET SPRAY TURNS THE CHORE OF BRUSHING YOUR DOGS TEETH INTO MORE OF A TREAT FOR YOUR PET. OTHER DOG BREATH REMEDIES are not formulated correctly and only temporarily mask the odors with oils, or even grain alcohols that can give your pet an awful upset stomach or even diarrhea. People who have switched to Pro Pet Works breath spray have noticed an extreme difference in their pets breath and oral hygiene! PETS LOVE the taste of our breath spray for dogs and cats. It works at the enzymatic level, which quickly eliminates the ROOT CAUSE of bad pet breath. Our formula also helps to fight PERIODONTAL DISEASE plaque and tarter build up. WHAT MOST PET PARENTS DON'T KNOW, is that bad pet breath is likely a sign of dental disease. According to the American Veterinary Medical Association, 70-80% of pets show signs of gum disease by the age of 3. THE AMERICAN VETERINARY DENTAL SOCIETY RECOMMENDS brushing your pets’ teeth every day. Now that is definitely a challenge! Pet dental spray is by far the MOST EFFECTIVE WAY, short of brushing, to restore your DOG or CATS sweet-smelling breath and to support healthy teeth and gums, without all that hard work! 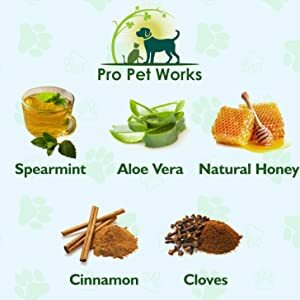 Pro Pet Works Pet Dental Spray is formulated from only the BEST, HEALTHY ingredients for your pet. 100% safe and 100% effective.